Despite an apparent re-awakened interest in singing, we don’t sing together like we used to. The plethora of TV programmes like X Factor and Pop Idol show how popular singing still is (but mainly they show us how desperate some people are for fame!). We buy CDs by the shed-load and download MP3 tracks like they’re going out of fashion. We love singing: we love to listen to it, and we love to join in with the karaoke down the pub or sing with our mates at the football match. However, despite the interest in TV programmes like The Choir, The Singing Estate, and Last Choir Standing, we tend to sing alone in the bath rather than in choirs or communities. Back in April 2007 I wrote of the “good old days when we all used to gather round a piano and just sing for hours” (Singing from the same hymn sheet) and of the important part that religion played in providing a large repertoire of songs that everyone in the local community would have known. The Staithes choir was one of three that centred around the Methodist chapels of the 19th Century. Today the choir has to spread its net wider to appeal to audiences, and they now include folk songs and more recent compositions. However, there has been some resistance to the choir’s more secular material, and audiences, particularly organisers, are not always in agreement with the choir’ diverse repertoire. 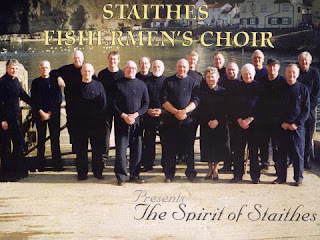 Unfortunately, like many long-established choirs (especially those relying on male voices), the Staithe’s men’s choir finds it hard to recruit new, young members. Slowly it will fade away as members gradually die. I’ve written before on the subject of the difficulty of attracting young men to choirs, and why it’s difficult getting to men to sing in any case (Where are all the male singers?). It was very satisfying to see Only Men Aloud on Last Choir Standing. However, they were in a minority. All the other male voice choirs in the competitions were had much older members, and the mixed choirs were distinctly lacking in male voices. I ran a Beach Boys workshop on Saturday and there were around 40 participants, of whom only six were men (and only one of these could have been called ‘young’!). I was chatting with a member of a barbershop group who said that they had run a series of free workshops for men to introduce harmony singing. They got about 4o blokes signed up for the short course, but afterwards, only two of them stayed and joined the barbershop choir. Something to do with the difficulty of making a regular commitment! But how come so many women in choirs manage to make a commitment? 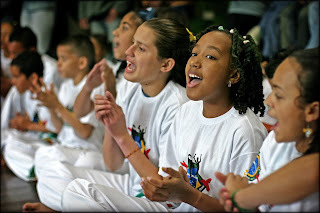 Why is singing more important to them? I don’t think I’ll ever figure out why more men don’t join choirs!